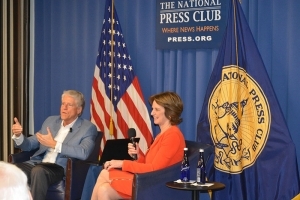 Rick Allen and Kathleen Kennedy Townsend, eldest daughter of Robert Kennedy, discuss their book, 'RFK: His Words for Our Times,' at National Press Club Book Event April 10. Robert F. Kennedy’s ability to win over hostile crowds and be civil during debates would serve politicians well in the present day, his daughter Kathleen Kennedy Townsend said during a Book Event at the National Press Club Wednesday evening. Townsend said Kennedy’s willingness to take on difficult opponents, like mob bosses or hostile crowds calling for civil rights, showed he wanted to engage with everyone and use civility while doing so. Along with co-author and editor Rick Allen, she discussed their book, “RFK: His Words For Our Times,” which collates Robert Kennedy’s speeches and writings and puts them in the context of their time. “He was able to win over people not by saying, ‘You’re selfish, you’re terrible,’ but by asking what kind of country you want to live in,” Townsend said of her father. The book, re-released to mark the 50th anniversary of Kennedy’s 1968 assassination, includes speeches he gave as attorney general, a U.S. Senator for New York and as a presidential candidate, as well as other writing. And given the current rancor surrounding the American political scene, Townsend and Allen said Kennedy’s words and actions are more important than ever. As an elected official, Kennedy shed light on people in areas like Appalachia and the Mississippi Delta who lived in extreme poverty, using his high profile and the media to tell their stories. Allen said that in Washington and elsewhere, it shocked people who were seeing “extraordinary poverty that most Americans couldn’t believe existed in our country.” Townsend said he used those trips as teaching moments for his children and younger generations.“He was always telling us how lucky we were, and how much we had to do for our country,” she said. With campaigning for the 2020 election already underway, Townsend said the long campaign as candidates traverse the country stumping for votes will make candidates stronger and give voters a real choice. She also said it is important that they use language that doesn't inflame divisions, which Kennedy was a master of. Townsend recalled hearing him memorizing quotes from William Shakespeare in their bathroom, or referring to other great works of literature during his time in the car on the way to his office. It is rare, she said, to see politicians so obsessed with finding the right words. “That doesn’t happen often for politicians, and it happened because he cared so much about language, about words and how it can lift us all up,” Townsend said.